Probably the most well-known of all commissioning programs (but the hardest to qualify for) is the United States Military Academy at West Point. Admission to West Point is open to civilians and to current enlisted members of the military. A West Point cadetship includes a fully funded four-year college education. Tuition, room, board, medical and dental care are provided by the U.S. Army. By law, graduates of West Point are appointed on active duty as commissioned officers and serve in the U.S. Army for a minimum of five years. Candidates for West Point are evaluated on academic performance, demonstrated leadership potential and physical fitness. All are required to be U.S. citizens and between 17 and 23 years old. West Point cadets must be unmarried, not pregnant and not under obligation to support any children. Above-average high school or college academic records, and good scores on either the ACT or SAT tests are also expected. Your high school curriculum should include four years of English, college preparatory math including algebra, geometry and trigonometry, two years of a foreign language, two years of science, and a year of U.S. history. Calculus and computer courses also are beneficial. And if you've participated in extracurricular activities such as clubs or student government, these will make you a strong candidate for admission as well. Before being admitted, potential cadets have to complete the Physical Aptitude Examination. This exam has five separate elements: a 300-yard run, two minutes of push-ups, a standing long jump, a basketball throw from a kneeling position and pull-ups. Each applicant gets one chance to take the test per application, so it's best to practice these exercises before the formal exam if possible. The application process for West Point involves a pre-candidate questionnaire and a nomination from a U.S. representative, senator, the vice-president or the president. Those who are currently enlisted in the Armed Services aren't required to get a nomination. 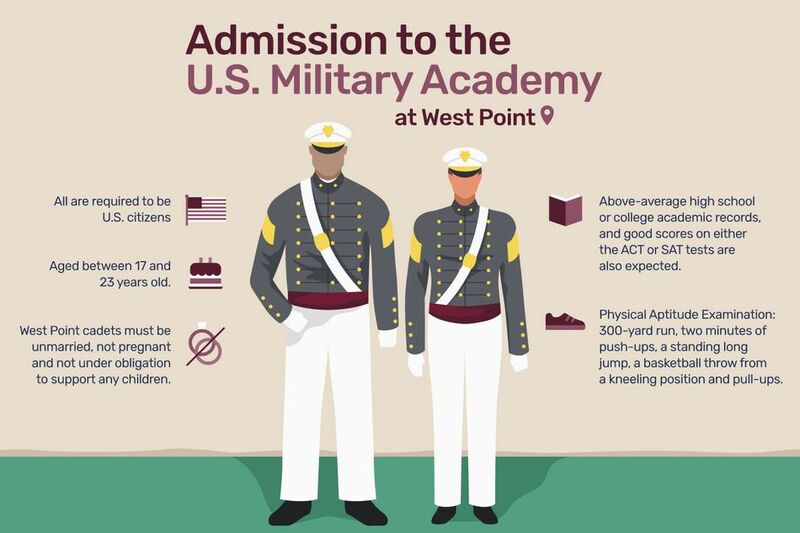 If you don't receive direct admission to West Point, you might be eligible for admission to the Prep School, also located in West Point, New York. Each year about 200 active-duty soldiers are offered admission either to the U.S. Military Academy or the Prep School. Most attend the Prep School first, although some are admitted directly to West Point. To apply for West Point or the Preparatory School, soldiers must meet the same criteria as other applicants, and have either a high school degree or a GED, and be of high moral character. Cadets at West Point have 45 academic majors from which to choose, including foreign languages, mechanical engineering, and economics. All graduates of West Point receive a bachelor of science degree. The core curriculum is accredited just like other institutions of higher learning and includes math, sciences, humanities and social sciences, along with military development programs. Cadets choose a major at the end of their second year. This requires cadets to take 10 to 13 electives in a specific major and write a thesis or complete a design project. The academic courses and the military preparation courses are rigorous and the schedule is demanding. But all cadets receive Christmas, spring, and summer leave as well as a four-day Thanksgiving break. When academics begin first classmen (seniors) get more weekend leaves than second classmen (juniors). A plebe (freshman) will have only a few weekend passes. Plebes also may leave West Point for extracurricular or cultural trips and athletic trips. During the six weeks of Cadet Basic Training, new cadets do not have privilege periods, with the expectation that they're still adapting to the military environment and its demands. But there is a day for a family visitation, and new cadets are allowed to call home on weekends. The transition from civilian life to a military environment is challenging. Cadets learn military courtesies and standards, and how to live by those standards every day. Even though it's an institution of higher learning, West Point still operates on a military structure. Cadets receive instruction in fundamental military tactics and leadership during a two-week intercession period between the first and second semesters. Field training is scheduled during the summer months at West Point and at military installations in the U.S. and around the world. Cadet Basic Training is a six-week program that includes daily physical fitness training to prepare for long marches, mountaineering, rifle marksmanship and tactical maneuvers. Eight weeks of field training takes place at Camp Buckner. Second Classmen (juniors) receive leadership experience in active Army units, serve as squad leaders at Cadet Basic Training and Cadet Field Training, or participate in military specialty training. A portion of the class participates in Drill Cadet Leader training at U.S. Army training centers, guiding new recruits. Another group participates in Cadet Troop Leader Training at U.S. Army posts and in locations around the world. The remainder of the class participates in Cadet Basic Training at West Point or Cadet Field Training at Camp Buckner. With the First Class year (senior year) comes more privileges, latitude, and much greater responsibility. Approximately half of the first class leads the training of the third class cadets at Camp Buckner and the New Cadets during Cadet Basic Training. The balance of the first class receives leadership experience in active Army units in Cadet Troop Leader Training. They may join United States Army units in Germany, Panama, Alaska, Hawaii, Korea or the continental United States. First classmen also participate in Military Individual Advanced Development training courses. Final preparation for the first class before graduation and a commission as a Second Lieutenant in the U.S. Army includes courses in the profession of arms.